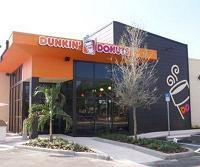 This week, Dunkin’ Donuts opened their first “green” store in St. Petersburg, Florida. The store is LEED (Leadership in Energy and Environmental Design) certified and has: energy-efficient insulated concrete foam walls, energy-efficient lighting, and water-efficient plumbing fixtures. Even more interesting is the store’s “earthworm casting facility,” where earthworms will eat the waste produced by the store. This may be a step in the right direction, but Dunkin’ has a long way to go considering that most of its stores use styrofoam cups and they seem to double-cup their drinks more often than some other coffee shops. To-go coffee cups and paper sleeves passed out by the hundreds at other coffee shops are not be completely eco-friendly, either, considering that not many make it back to the recycling bin. But in fairness, a lot of the paper goods used at coffee shops do start out with some percentage of post-consumer recycled paper, and that is a much bigger step towards being eco-friendly than changing the energy needs of one store.